Pun Hlaing Golf Links is an18-hole, par-70 golf links, located just 30 minutes from Yangon city centre. Built in 2015, the course has excellent drainage, resulting in year-round playing conditions and arguably the best greens in Myanmar. Measuring just 6,000 yards, this is a course that rewards strategic, controlled play in order deal with the tight fairways and avoid the deep and well-placed bunkers. 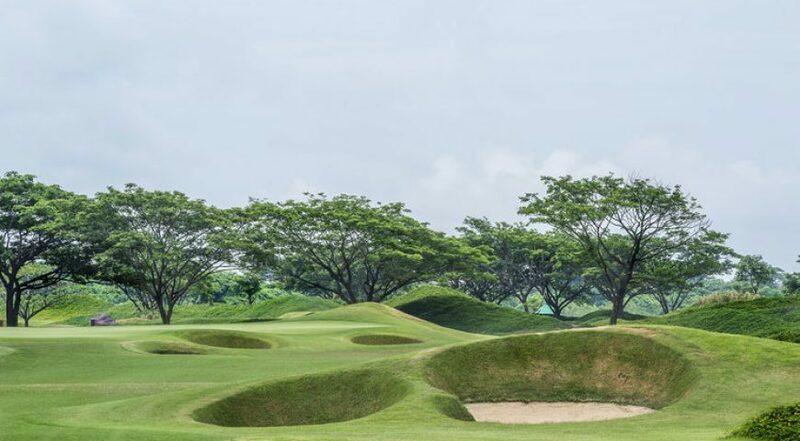 Pun Hlaing Links GC facilities are world class with a covered 14 bay floodlit driving range and short game practice area, as well as a Golf Lesson swing studio for the PGA Professional. Full changing room facilities for both males and females, offer the opportunity to freshen up following a round and before hitting the Clubhouse. The sports bar themed Clubhouse does not disappoint, serving up traditional western fair and beverages. Considered by many to be Myanmar’s hidden golfing gem. It’s immaculate greens, unique links layout and convenient location make it a course not to be missed for any golfer visiting Myanmar.